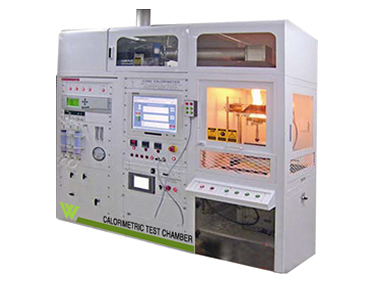 Calorimetric Test Chamber is used for quantitative and qualitativeinvestigations of energy expenditure for routine fuel tests or for occasional calorific tests. It measures heat release rate, smoke release, ignition time, oxygen consumption, carbon dioxide and carbon monoxide generation, mass loss rate. 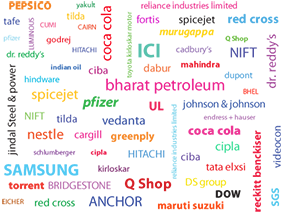 The entire range we offer is highly reliable and stable for being produced as per the latest market trends & using premium raw-materials. 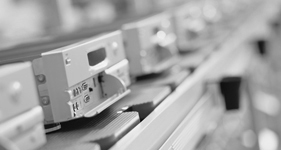 Our Calorimeter Test Chambers are built into a single, compact cabinet to provide a self-contained operating unit producing reliable results with good repeatability. The durable ergonomic design promotes one-hand, one-touch operation so sample measurements are taken in seconds. The Chamber also known as Fuel Test Chamber. 19 inches analysis rack (customizable). Automatic Spark Igniter to facilitate measurement of ignition time. Auto Split Shutter automatically opened to transmit radiation to the sample. Gas Analyzer to exactly measure O2, CO, and CO2 concentrations up to 0.02%. 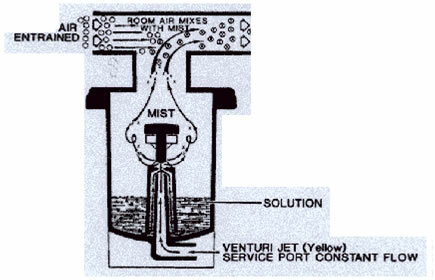 Port, heated filter, and heated line to measure toxic gases. MFC(Mass Flow Controller) used for all gas flows, improving accuracy of and automatically controlling flux . 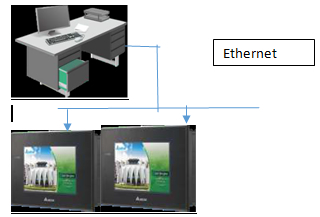 Separate data acquisition system (optional). Based on the principle that the amount of heat released from a burning sample is directly related to the amount of oxygen consumed during the combustion. The amount of heat a material generates is directly aligned with the severity of a fire, such as fire growth rate. 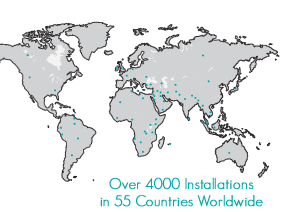 In order to access the material flammability it is exposed to an external radiant heat source. Typically the samples are exposed to an external flux form the heater.Once enough pyrolysis products are generated, ignition occurs. The combustion product travel through the Cone heater and through an instrument exhausted pipe. The values measured/calculated. 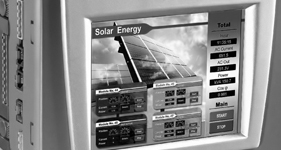 Calorimeter is made for easily controlling the whole parts with DAQ (Data Acquisition) Program. 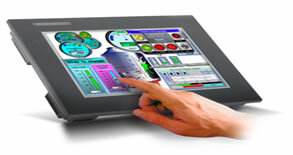 And touch screen helps to test automatically as well as reduce installation space. 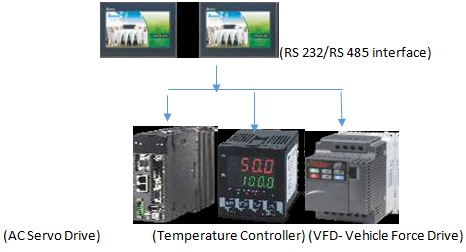 Additionally 5 Step Temperature Controller (optional part for R&D purpose) helps to measure combustion characteristic about specimen by temperature change and temperature rising time after setting up virtual temperature of real fire conditions. This option helps to measure various results similar to real fire environment. 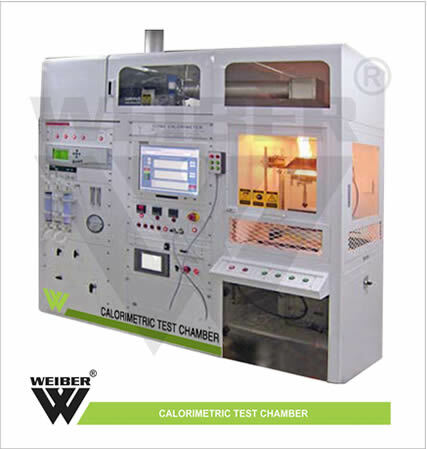 WEIBER calorimetric chambers are double walled convection heated and cooled units. Outer body of our environmental chambers are constructed out of thick PCRC, pre coated corrosion resistant GI sheet duly pre-treated with primers and rust proofing and painted with long lasting stove enamel or elegantly powder coated. The inner chamber is made of heavy gauge stainless steel sheet of SS-304 grade). The gap between the walls is filled high grade mineral glass wool, which ensures maximum thermal efficiency in our chambers. Heating: Indirect heating system is provided in our units, comprising of air heaters made of high grade Kanthal A-1 wires of suitable wattage. The warm air is evenly distributed throughout the chamber through efficient motor fans ensuring very good temperature sensitivity. Cooling: An energy efficient cooling unit is installed in our photostabilitytest chambers to enable studies at lower room temperatures. We use high end CFC free compressors of Kirloskar/Tecumseh / Bitzer/ Denfos make, conforming to latest international standards and guidelines. COOLING SYSTEM The compressor is mounted perfectly to ensure recommended level of sound and vibration. Hand Shut off Valve Is the only Condensing Unit, which is equipped with it. This valve is used for pump down the total gas in to the condenser & receiver in the faulty condition. Liquid Dryer of Danfoss make Which is equipped in the liquid line for ministration of moisture in the liquid. It will collect all the moisture in side the refrigeration line as well as gas. 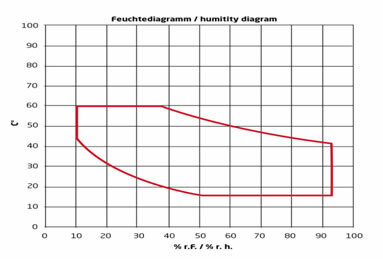 Moisture Indicator of Danfoss make The sight glass area in the Moisture Indicator shows at a glance the condition of the refrigerant system. The moisture indicator element changes colour and indicate if the system is safely dry, or dangerously wet. Solenoid Valve of Castle make In most refrigeration applications, in order to automatically control the flow of fluids in a system, it is necessary to be able to start or stop the flow in the refrigerant circuit. An electrically operated solenoid valve is usually used for this purpose. Its basic function is the same as a manually operated shutoff valve, but it can be positioned in remote locations, and may be conveniently controlled by simple electrical switches. Suction Accumulator Maximum Efficiency of the relief device (expansion valve) because it is supplied with sub cooled Liquid. 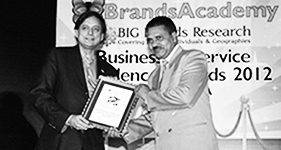 Liquid Receiver As per ASME Section VIII Division I for storage of refrigerant.